Vacations are all about relaxation. For an increasing number of us, that means taking time for pampering at a spa. In fact, the global spa market is forecast to rise at a compound annual growth rate of 5.66 percent from 2017 to 2021, Technavio reports. Should your resort harness this trend and add a spa? Here, Ilana Alberico co-founder and president of ISM SPA, a company offering concept to completion and ongoing management of spa and wellness in the hospitality and residential industries, provides insider tips on how (or whether) to do just that. When adding a spa to an existing resort, is there a typical Average Daily Rate above which a spa makes sense? I suggest letting the ADR guide the caliber of spa you should develop. Because ADR fluctuates with the season and mix of guest type, when looking at adding a spa offering, evaluate the guest demographic and mix. Typically, for a highly successful spa, we like to see ADR’s north of $200 with a strong transient guest segment. Research shows that having the spa amenity simply available increases ADR, so we know that guests appreciate the option and perceive a property with a spa as more attractive. The first thing to consider is resort’s brand and why guests are coming to the property. Geography plays a role. If the resort is a destination property, it must have a spa offering. If a spa is in an urban environment, the competition for other spa offerings may be too high. In this case, a resort may be able to partner with an existing day spa to drive that experience for the guest. Think about the size and scope of the spa. We like to build spas to be financially feasible. So, we recommend that at least 60 percent of the space is revenue-producing square footage. 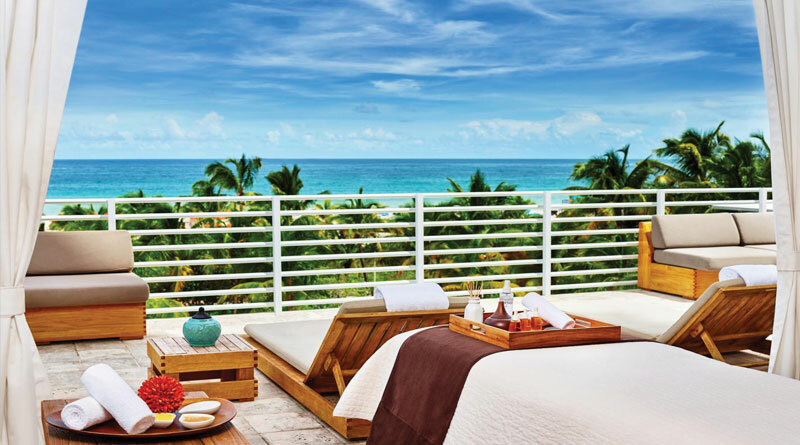 When does it make sense for a resort to bring in a spa consultant to help them get the spa off the ground v. bringing in an outside company to install and run the spa? Do not bring on a spa consultant who cannot support the ongoing operations management of the spa. Otherwise the property could be in a situation where they have a beautifully designed and overbuilt spa and no support in running it. We have seen this too many times. That being said, anytime there is a spa being designed there should be a spa consultant driving design decisions. The design of the spa should be directly linked to two things, the feasibility drivers (number of treatment rooms, locker room amenities, wet areas or not) and the concept. The feasibility drivers determine the nuts and bolts of the spa and allow it to be designed for maximum utilization. The concept determines the guest experience and ties design elements to the overall vision and concept. What are typical profit-sharing arrangements? How does this work? These range widely across the industry and there are no set splits. For ISM Spa, we have two models, a revenue share model and a management fee with profit share model. In our revenue share model, it is exactly that, the property and ISM Spa split the revenue and we take on the operational burden of the spa including all of the employees, products, supplies, marketing. In a management fee with profit share model we take on the same operational burden but the client holds the bookkeeping and once the spa hits a profit threshold we share in the overage. What types of “minispa” facilities are possible? What services are best in this type of operation? Wellness can be accessible regardless if there is a spa on property. If weather permits, you can create wellness stations around your pool or property using cabanas for treatment rooms. You can use a third-party app, such as Soothe or Zeel, to access therapists. Just remember that these therapists are not trained in your brand standards and would simply be standing in on demand. You can also utilize a spa management company or a local day spa to develop wellness programming using your fitness, pool and property and provide ongoing management of those programs. Should resorts considering this possibility simply reach out to spas in their area? The most important thing when moving in this direction is to vet the day spa. Call the day spa and book a service. See what the front desk is like. Are they accommodating? Are they trained in describing the services? Are they elegantly up-selling you? If the answer is no, don’t waste your time. If yes, go in and get a treatment. Is the day spa clean? Are the providers in uniform? Is there a manager on property or is the owner still having to run the business? If you feel confident in the upkeep of the facility, the management, the massage quality and the front desk then this could be a good partner. In this situation the bench strength of the day spa is important as is the training of the therapists. It’s also critical to clarify who will be providing insurance. Do you offer ongoing management support and in what capacity? Find out if the consultant is a small outfit of one or two people. If this is the case, it’s highly doubtful that they will be able to provide you the support needed once the spa is open unless they severely limit their client load. During the financial feasibility phase, you’ll produce a pro forma for me. Once you check back in on clients a year after opening, within what percentage is your pro forma to the actual performance of the spa? May I have the name of a recent project that you have worked with and checked back with regarding their performance as a reference? Can you share photos and examples of spa concepts that you have created so I can see your creative capability? What is your methodology of integrating the spa into the resort’s operations? How do you market the spa to the outside community, if applicable? How do you recruit employees for the spa, and who trains the employees? What standards and methods do you use to train employees? Have you owned your own spas? This is a really important question. Have they put their money where their mouth is? Have they operated resort spas as a spa director? Have they worked in a corporate office for a hotel or spa management company? Provide clients with high-impact editorial, advertising, and public relations concepts, writing, graphics, and production. Key clients have included Brand Tango, Interval International, Indiana Living Green magazine, Pace Communications, and the American Resort Development Association. Specialties:high-impact editorial, marketing, and public relations writing, concepts, graphics, and production.